While I wouldn’t qualify my riding history as anything worth bragging about, I have ridden through some spectacular places. 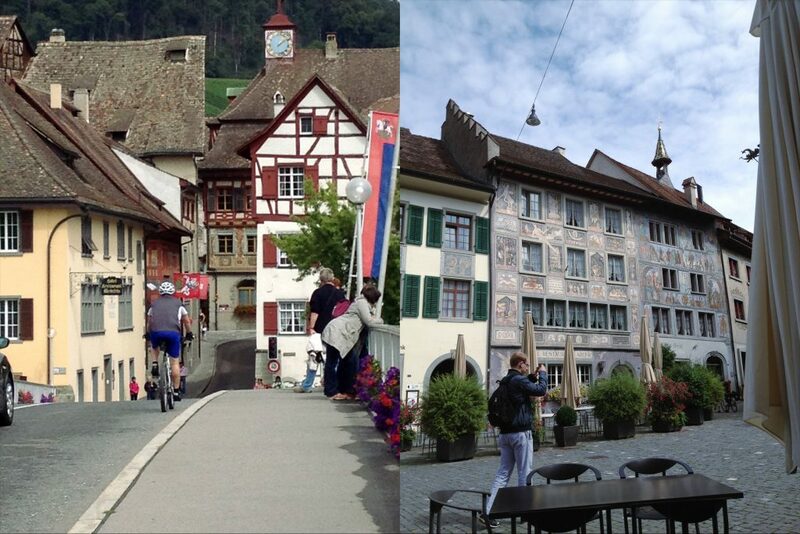 One ride I enjoyed was biking through Switzerland, then into Germany on my way to Eurobike. You see, once a year all the biggest bike nerds from around the world descend on the small town of Fredricshaffen Germany to see the newest and shiniest bike goods released that year. About three weeks before we were scheduled to take off for the show, my friend and co-worker Steve brought up the idea of riding the 80 miles from Zurich (where we were landing) into Langanargen Germany where we were staying. Out loud I immediately said “Yes”, but in my head, there were doubts. 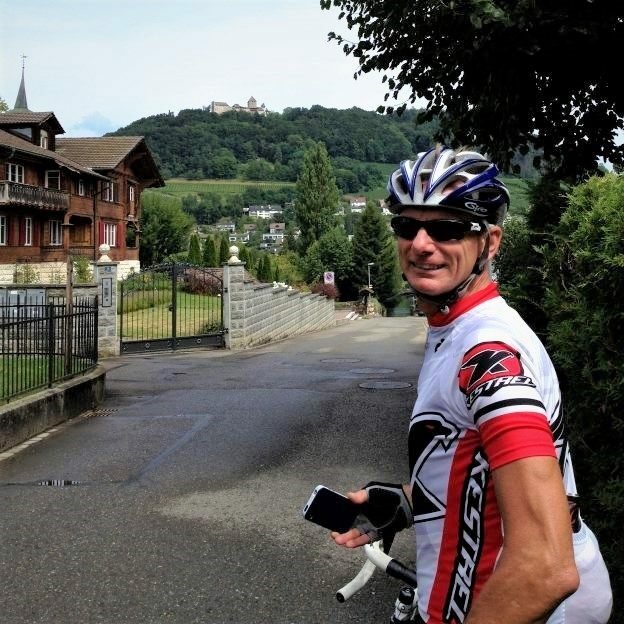 I know, why would I have doubts of riding from Zurich through Switzerland’s wine country, along the Rhine, across Lake Constance and through some of Germany’s most beautiful countryside? Please understand, I didn’t have doubts about the ride itself. My doubts came from doing the ride with Steve. He is one of my favorite people and I have ridden with him frequently. On those adventures I have learned a few things that made the idea of a leisurely scenic ride seem impossible. While Steve is one of the nicest people I know, I’m convinced that in a past life he must have committed some horrible crimes and tries to punish himself every time he rides. So, I’m thinking its going to be a big job for me to keep this casual. Our flight departed Philadelphia at 7 p.m. and landed in Zurich at 6 a.m. I didn’t sleep well on the plane and realized that I would be riding a whole day on two hours of bad sleep. Steve and I busied ourselves building our travel bikes in the airport baggage claim. We gave the balance of our bags to co-workers who were driving into Germany, then set off into a beautifully sunny August day. Leaving Zurich airport was an un-scenic start to what would end up being beautiful ride. Strangely, the bike lanes around the airport didn’t seem to go anywhere, but “around” the airport. So after circling a few times we decided to ride up to what looked like a highway off ramp. Fast forward through a few minutes of urban riding, we climbed out of Zurich, into farmlands and the town of Bülach. This town was founded in 1384 and offers many historic and architectural beautiful buildings around the reformed Church of Saint Laurentius and the Sigristenkeller gallery. Shockingly, even though Bülach was less than seven miles from the airport, it is remarkably rural. Our loose ride plan was to head north until we hit the Rhine, then follow the river east to Lake Constance and then take the ferry into Germany. Both Switzerland and Germany have well established bike routes to guide us through wine country and onto our eventual destination of Langenargen. Remember Steve and my doubts when planning this trip? From the start there was no relaxing, or enjoying the sights. Steve, as I expected, went full throttle. As I mentioned before this riding trait of Steve’s was going to be a detriment to my enjoyment riding through Switzerland and Germany. Don’t worry, I had a plan. Every time Steve entered into his personal pain cave, I would stop to change tire pressure, take a picture, check the map or do whatever it took to slow him down. Before you pass judgement of my passive aggressive strategy, realize that I have had conversation with Steve about this ride being a slow one and to Steve’s credit he agreed. What I know from a history of riding with him is that he may agree to one pace. But his legs will invariably pick another pace, intense. So, I hoped that my plan would work to get this ride down to a conversational relaxing speed. Happily, it only took about 15 minutes of stops, pauses and sidetracks to get Steve’s legs into my way of thinking. Steve’s leg are starting to get the idea. Here he is surveying an empty field while I pretend to adjust tire pressure. As we snaked our way down country roads through the vineyards and small towns of Switzerland we crossed many small tributary waterways. These canals are used as irrigation for the vibrant fields this countryside is known for. 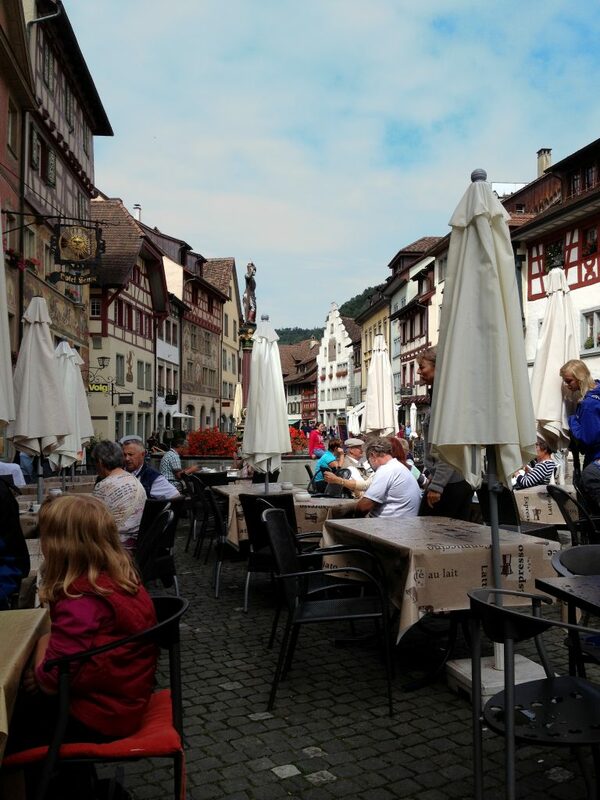 Our first major crossing, across the river Thur came in the town of Andelfingen. This is the main town between Schaffhausen and Winterthur in the heart of Zurich’s wine country. It boasts cultivated fields, timber framed houses and walking/cycling paths. Andelfingen is where grapes for Zurich’s sparkling vin du pays ripen in the autumn and is also the home of the Andelfingen castle, a well-kept park open to the public during the day throughout the year. Seeing as we were on our bikes and had to make it into Germany before dark, we did not stop to enjoy the sights here. In retrospect, I would recommend taking more than one day for this ride so you can stop and enjoy the unique personalities of each town. Emerald landscapes abound in Andelfingen. Stein am Rhein is a lively and very charming small town. Among the sights are the Monastery of St. Georgen (one of the best-preserved Medieval monastery complexes), the Lindwurm Museum (depicting 19th century bourgeois) and overlooking everything is the Hohenklingen Castle. The castle here was built high above the town in 1225 and recently renovated. Steve and I walked through the center of town with our bikes in tow. We found a courtyard surrounded by fresca painted buildings and filled with restaurants and outdoor seating. We picked a quaint little place that had old wood paneling and benches as our eatery of choice (great carpentry typically means good food after all). For me, the meal and the company were great. I enjoyed a few local brews and a plate of barely cooked beef that could only be described as meat candy. Armed with bellies full of meat and hefeweizen, Steve an I set off east along the Rhine. Our old world surroundings at lunch. As the Rhine empties into Lake Constance, the first large body of water is called Untersee (or Lower Lake Constance). To our left are miles of beautiful waterway and to the right we passed hop farms, villages and port towns that make up the Hochrhein. Again, with more time I would have loved to stay and explore, but we were on a schedule. Pedaling along, we ambled along the shore for an hour until we entered the more metropolitan area of Constance and Altstadt. In Altstadt we went north, crossed the Rhine River into Staad then boarded the ferry for the last lag into Germany. A panoramic picture of the bike path and view along the Untersee. While traveling by bike is convenient, I must say, getting onto the ferry by bike was a real treat. Our fee for the ferry was far less than that of an automobile. We were also the first ones off the ferry and into Meersburg, Germany. Here we were waved through the border checkpoint at 20 mph and got to zoom past miles of waiting cars. Of the entire ride, Meersburg is by far the most beautiful scenery. Maybe it was the fact that the sun came out in full force or me being rested from the 45 minute ferry ride. Whatever the reason, the ancient town of Meersburg was breathtaking. 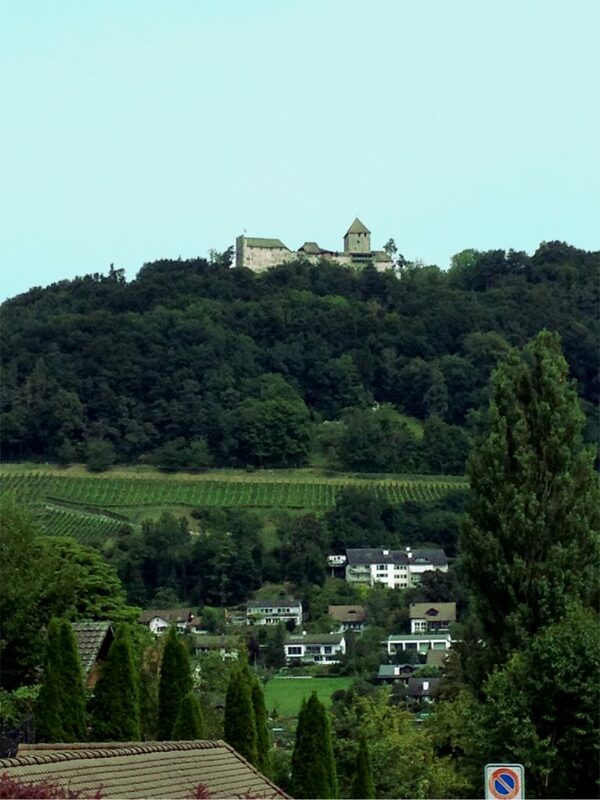 The town is built on the steep banks of Lake Constance and was originally a vineyard. It’s heritage as a fortress is apparent in the architecture as well as the walled bike route that snakes along the shore of the lake. Once Steve and I left Meersburg my body began to shut down. I wish I could give you a rousing account of the great bike paths and warm forests we passed as we rode through Friedrichshafen and into Langenargen, but to be honest, I was operating in survival mode and not really taking in my surroundings. Maybe it was the heavy lunch, lack of sleep or the miles we rode, but moving became very difficult. As I have said before, this is a ride best done over several days rather than all at once. As a result of riding it in one day, I was now suffering through every additional mile we pedaled. We finally arrived in Langenargen in the early evening. Happily, I checked into my room, took a quick showers and made it to dinner with the rest of the group. While at dinner, drinking a Dunkelweiss and enjoying my schnitzel, I reflected back on why this ride was so fun. The first thing I must say is that great company almost always makes a great ride. In this case, Steve and I rode at a similar speed and had great conversation throughout the trip. Additionally, we were both enjoying this route together because of our mutual even keeled demeanor. The great company riding together allowed us to stay positive even when we went slightly off course. Another help was that I was able to send my luggage ahead and ride the route unfettered. Knowing that I had clean clothes waiting for me when I arrived was a large motivator over the last five miles. Ultimately, I would recommend this route to anyone. The ride was predominantly flat and had ample opportunities to stop and enjoy the scenery. Additionally, there are more than enough great towns to stop at and enjoy. In fact, this ride could easily be spread across a week, with mornings spent in the saddle and afternoons sightseeing on foot. See Jen Reviews on the 100 Best things to do in Switzerland. This entry was posted in News and tagged 100 Best things to do in Switzerland, bike blogger, bike europe, bike germany, bike lake constance, bike Switzerland, bike tour, bike touring, bike tours, Bike travel, bike zurich, cycling tour, cycling tours, folding bike, gemany by bike, Have Fun Biking, Jen Reviews, lake constance, meersburg, stein am rh, tour germany, tour lake constance, tour zurich, travel bikes, zurich by bike on January 21, 2018 by John Brown. Great rides you may have never heard of will be this summer’s fun! Springtime will soon be here and some great rides and races are coming with it. We all know about the standard rides and races. These rides start when you put your feet on the pedals, follow a leader and finish a few miles later. What you may not know is that there are heaps of other ride and race types out there and they all are really fun. Riding to dinner or the bar is a great way to integrate a bicycle ride into your weekly habits. If you want to take that concept to the next level there are guided rides that will help. I recently wrote about a doughnut ride I went on which fits this category and it was a blast. Other such rides include the Sojourn, Sonoma wine tour or the H+I Taste and Trails mountain bike tour of the Scottish Highlands. 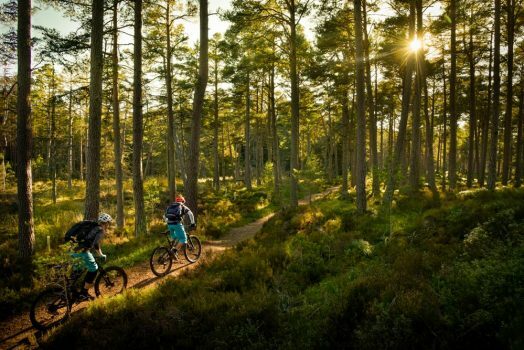 Mountain biking through Scotland at day, and touring distillers at night. Unlike the food and drink rides, a poker ride isn’t a tour of underground high stakes poker games. Sadly, you won’t be rubbing elbows with mafia kingpins while donning Lycra. Instead a poker ride is a mountain bike ride, with checkpoints. The checkpoints (5 or 7 depending on the type of poker) gives out a playing card to each rider as they pass each station. At the very end of the ride, hands are compared and a “winner” is declared. Because of gambling laws these rides often generally offer products as prizes and are fun for all, because the “winner” doesn’t have to be the fastest rider. The most popular version of this ride is the Redbull Fox Hunt (check out the video). Basically, all the riders start down a course at once (the foxes). After a few minutes, the “hound” (a really fast rider!) is let loose down the same course. The “foxes” job is to not get passed and the “hounds” job is to try and pass everyone. While still small in numbers, because they end up being so fun, the amount of these rides are growing. Popular in Europe, bike and barge rides are just what they sound like. 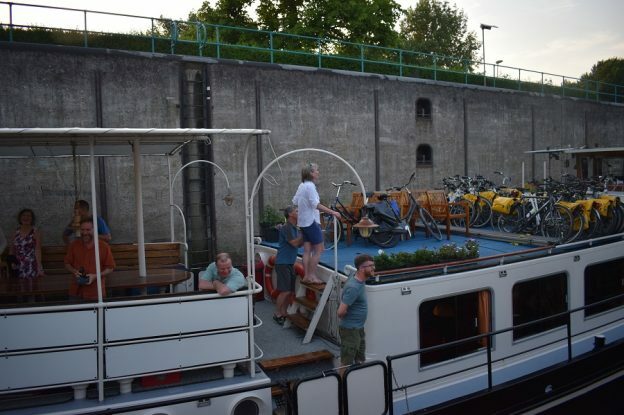 Sleep and stay in a barge on a canal and ride different portions along the canal during the day. 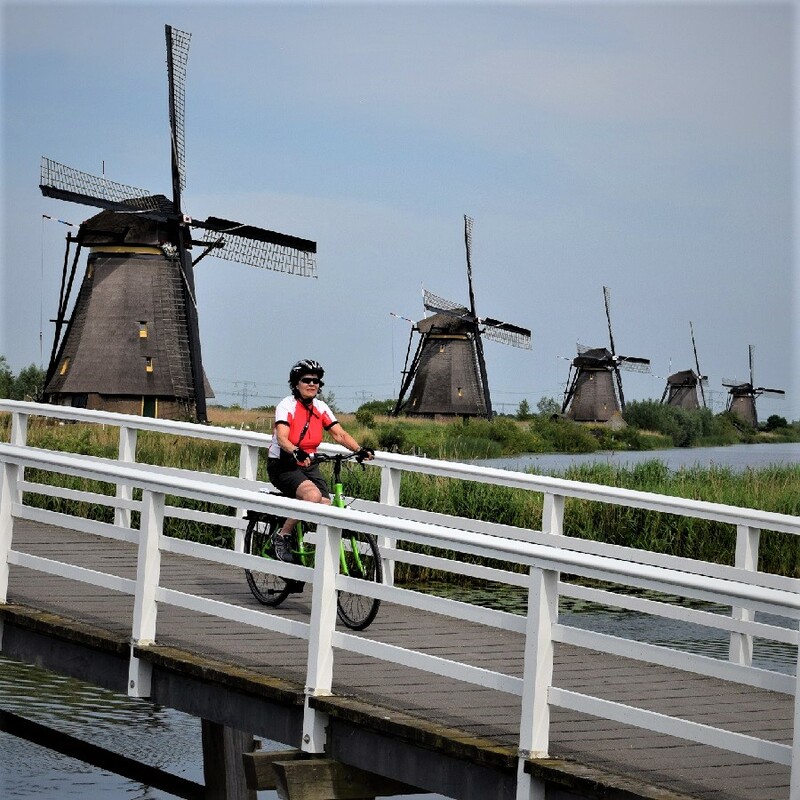 Sleep on a barge at night and then ride your bike, passing windmills during the day is a fun way to see Europe. Many of these rides (including one in our Amsterdam review) are similar to food and drink rides in that they dock the barges near great locations. An Enduro is probably the most popular new race type in mountain biking. The basic idea here is to ride and race at the same time. How it works is you ride up the hills within a pre-set time then race through timed, downhill sections. At the end, all the timed sections are combined, with the lowest time being the winner. Overall, these races have a fun and cordial environment, with lots of conversation and community during the un-timed sections. Like an Enduro, the Grinduro events have ride and race sections. Unlike an Enduro, Grinduros are ridden on gravel bikes rather than mountain bikes. Gravel bikes also find a home in gravel grinder events. 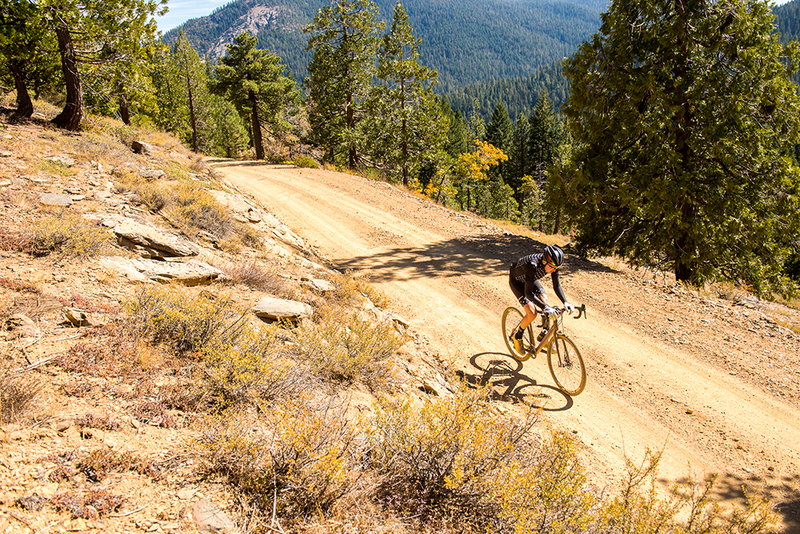 A gravel grinder is either a bike tour or race that covers dirt and gravel roads. Events can be as short as 20 miles and as long as a few hundreds. 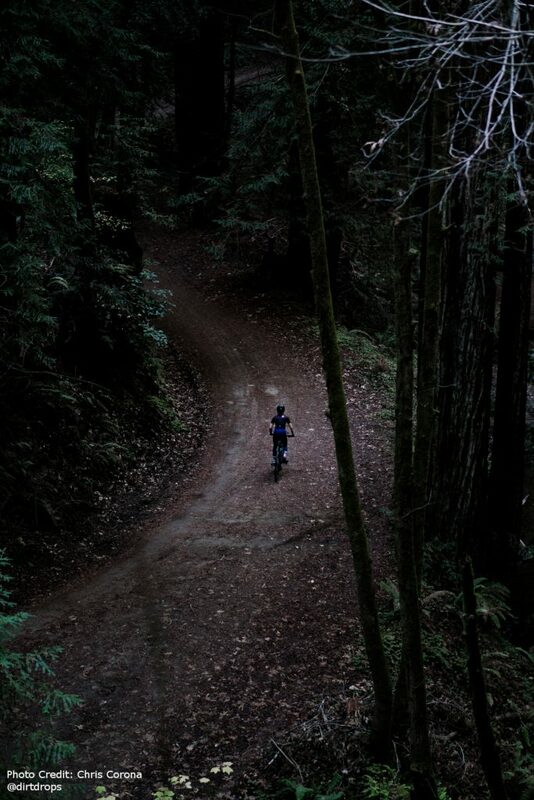 A scene from 2016’s California Grinduro. Mountain bike stage races are events that take place over a series of days. Each day is a different course and each course often starts and ends at approximately the same place. For most, the Idea of winning one of these races is not the reason they come out. With so much downtime each evening and because most of the lodging or camping is close together, these races take on a sort of festival atmosphere. Additionally, these events are often run in family friendly locations so the whole family can come along. Hopefully this is the year you will find yourself at a new ride or race. With so many options the fun you and your family can have is nearly limitless. This entry was posted in News and tagged bike and barge, Bike Ride, bike rides, bike tour, bike tours, enduro races, food rides, fox hunt rides, fun bike rides, gravel grinder rides, great bike rides, grinduro, mountan bike stage races, poker rides, poker run, road ride, road rides, stage race, stage races on January 14, 2018 by John Brown. Winter is the time of year my thoughts drift to the beautiful surroundings of warmer climates. Having traveled with my bike a great deal, I can attest to the fact that riding new trails and roads will invigorate your riding. The big issue with traveling elsewhere to bike is finding the good trails, best routes or fun secret spots only the locals know about. That’s why I recommend you enter destination bike races. Not to try and win the race, but for the route. How can you enter a bike race, but race? Any competition is not a race if you don’t try hard enough. So ignore your placement in the race results, relax, and think about the event as a well organized ride instead. This mentality works best for long events. For that reason, road circuit races are out of the question, but there are loads of mountain bike, Gravel, and road events that fit the bill. Why go to a bike race? The best reason to register for a race but not actually treat it like a race is the convenience. 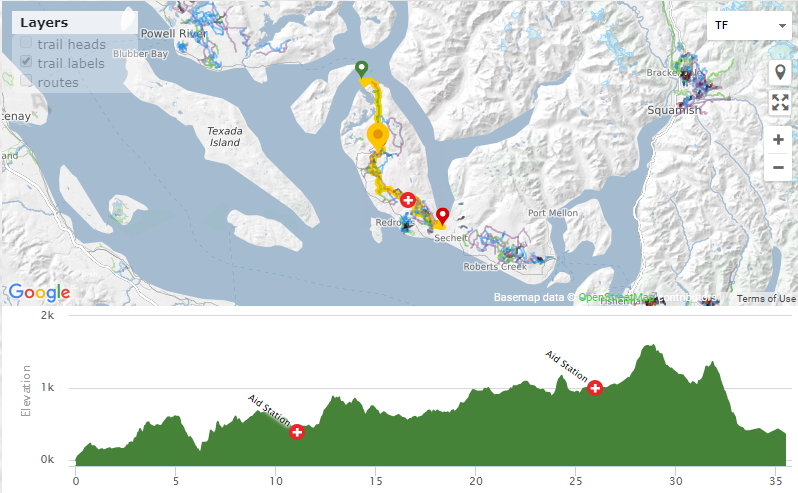 As an example, If you want to schedule an awesome mountain bike vacation on some of the best trails in the world, going to the BC Bike Race would be a good option. 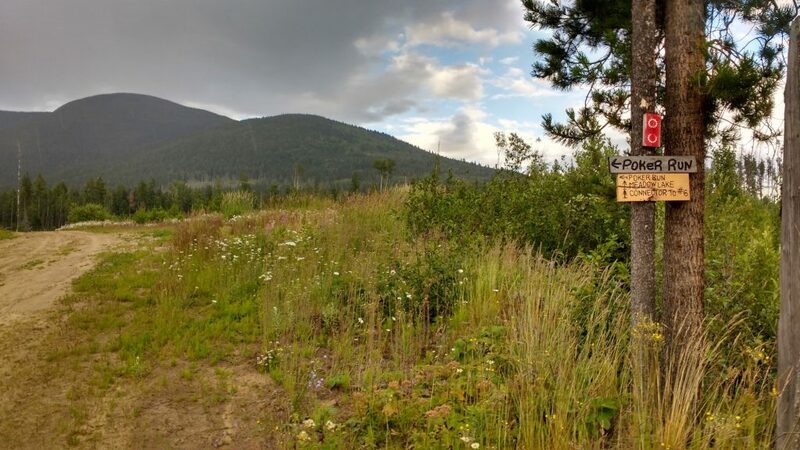 By registering, you have access to lodging, food, bike support, rider support and above all else eight preset courses are offered through BC’s best terrain. While you pay for this convenience, the cost is similar to if you were to plan it yourself with a lot less headache. Also, cycling events are family friendly by design, so bring everyone along! With all these new options available to you, how do you pick your event? My recommendation is to start with location. Pick some areas you want to visit and ride in. Next check local calendars and see if any events will match up. Finally, register for the event of your choice and plan your vacation! 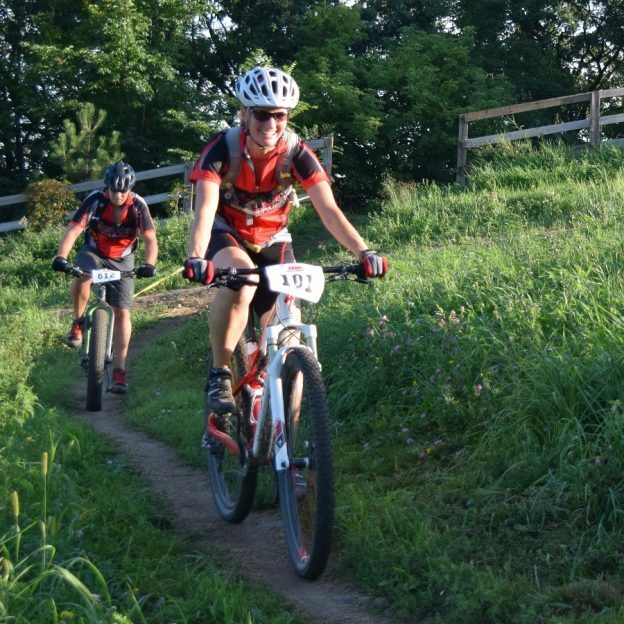 Mountain bike races are usually really long (like the Circumburke trail challenge in the Kingdom Trails of Vermont or stage races like the Transylvania Epic in Pennsylvania). The long single day races are fun way to test yourself and achieve a one-day goal and are awesome if you have limited time to get away. If time is not as much of an issue, stage races are where it’s at! Stage races are shorter individual rides spread over a series of days. They usually expose you to many different sections of popular trail networks as well as have a great festival atmosphere. There are few joys that compare to experiencing new trails. The popularity of gravel rides has exploded in the past few years thanks to dedicated people putting on world class events all around the globe. Many of these races started humbly but have grown to mythic stature. Events like Kansas’ Dirty Kanza 200 might be a stretch for most with it’s 200 miles of tire-splitting flint rock. However, for those interested in the adventure of a gravel race with a bit more approachable distance can look at Iowa’s Colesburg Gravelpocalypse with routes as short as 20 miles. Whatever your distance, gravel races are an amazing option with events all around the country. Lovely new roads await on countess events around the world. 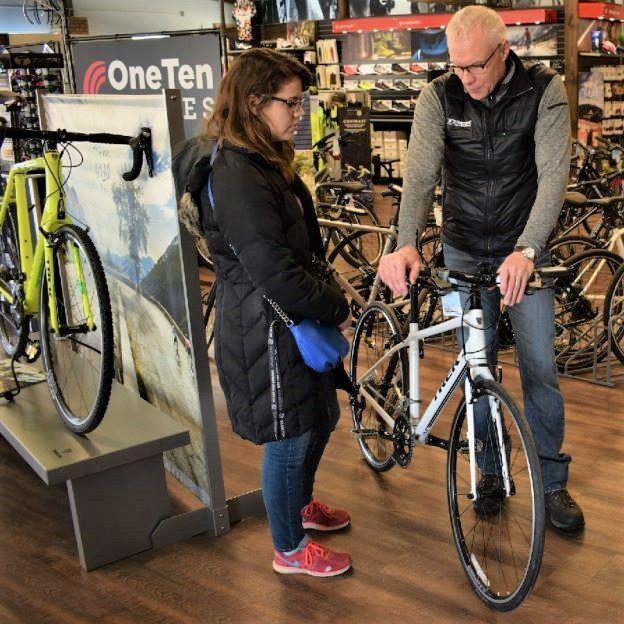 This entry was posted in News and tagged bicycle race, bicycle races, Bicycle touring, bicycle tours, bicycle travel, bicycle travels, Bike race, bike races, bike tour, bike tours, Bike travel, bike travels, new bike routes, New bike Trails, travel bikes on January 6, 2018 by John Brown. 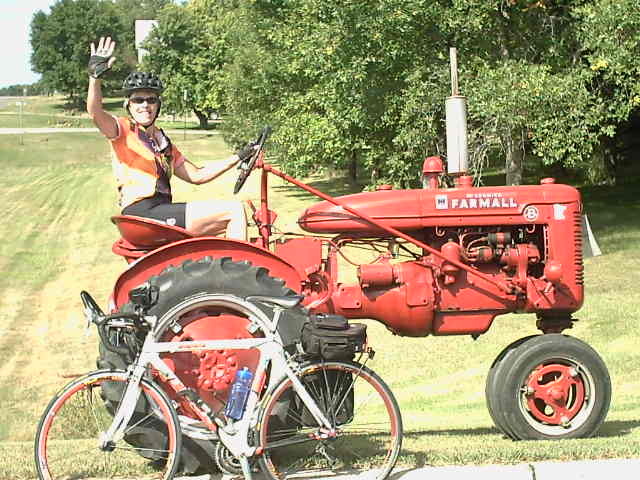 It’s Ice Cream Smiles Friday and today we found a picture from the Root River Bluff & Valley Bike Tour that happened this summer. 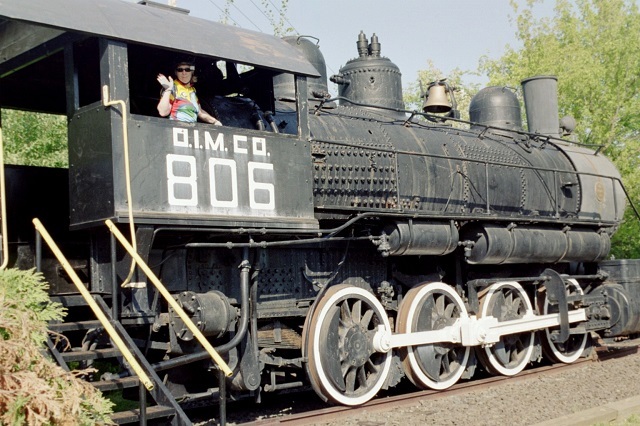 Next year’s Bluff & Valley Tour will take place July 7, 8 & 9, starting in Peterson, MN. Watch for more information on this ride and other 2017 bike tours in December. 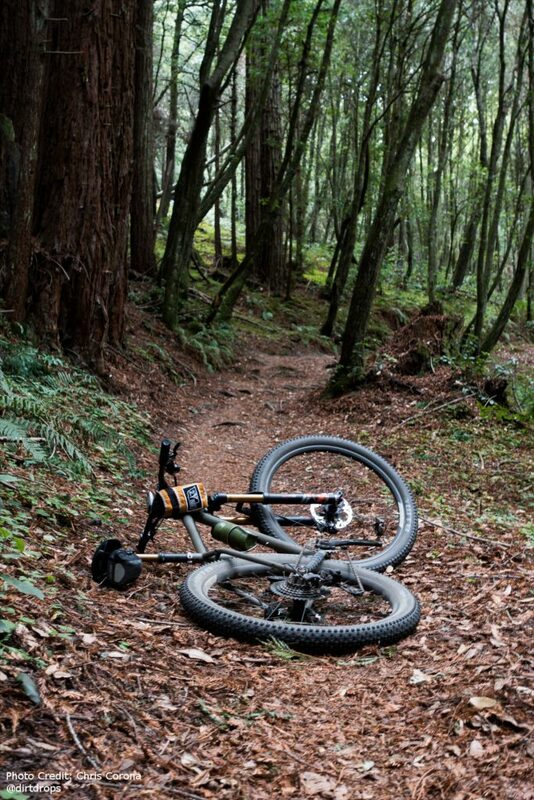 So bookmark HaveFunBiking.com and find your next adventure. Also, don’t forget to smile while you are riding and having fun. After all, we may capture you in one of our next photos that we post daily. 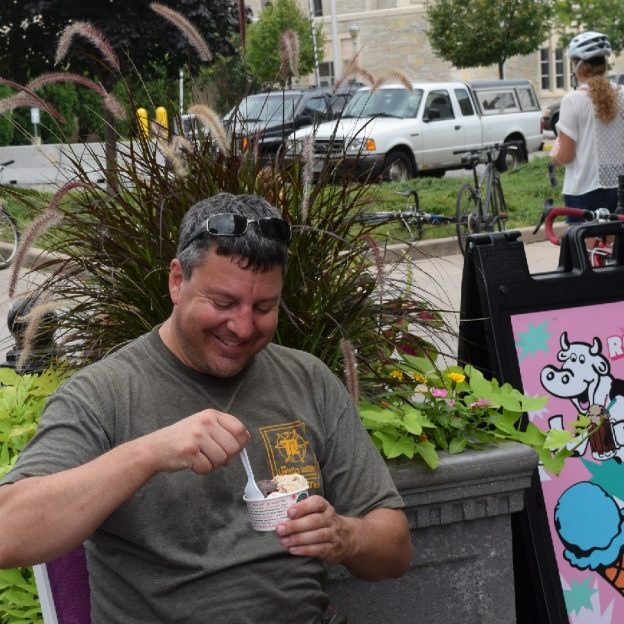 This entry was posted in News, Picture of the Day and tagged #explorewisconsinbikefest, #icecream, #icecreamsmilesfriday, #nextbikeadventure, bike tours, Bluff Country, Driftless Area, ice cream smiles Friday, Minnesota, Root River Trail Towns on September 30, 2016 by Russ Lowthian. It’s Ice Cream Smiles Friday and today we found our picture of the Week taking a break from his ride while enjoying a cool treat. Photo was taken at the 2016’s LaCrosse Bike Festival that takes place each year over the Labor Day Weekend in La Crosse WI where several bike trails meets the Mississippi River Trail. Thanks for viewing the LaCrosse Bike Festival Pic of the Day. This entry was posted in News, Picture of the Day and tagged #explorelacrosse, #explorewisconsinbikefest, #icecream, #nextbikeadventure, Bike & Brew, bike tours, Driftless Area, ice cream, La Crosse WI, Mississippi River Trail on September 23, 2016 by Russ Lowthian. Bike Pic June 22, Summer is officially here, have fun! The summer solstice was this week which means that summer has officially began! 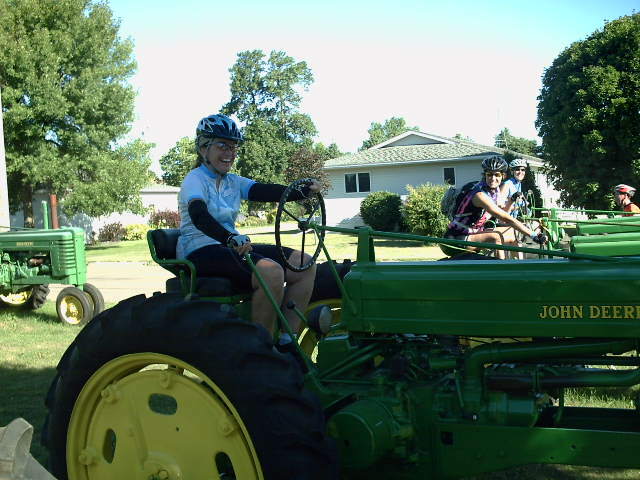 Today’s Pic is summer fun on the Swiss Cheese & Spotted Cow Bicycle Tour. 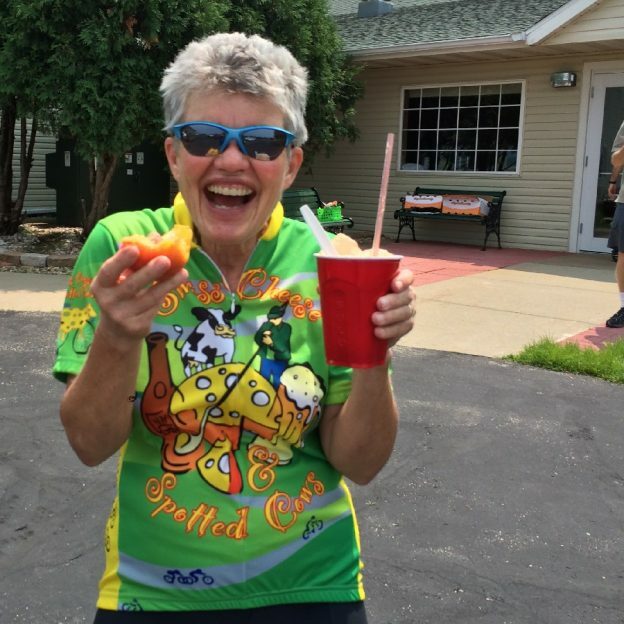 Here a 2015 ride participant enjoys a fresh peach and locally brewed root beer. We hope you enjoy these daily Pics, and will share some of your fun adventures throughout the summer. This entry was posted in Picture of the Day and tagged #FindYourNextAdventure, bike tours, biking, First day of summer, summer bike fun on June 22, 2016 by Russ Lowthian. Bike Pic Feb. 12th, ice cream smiles Friday! 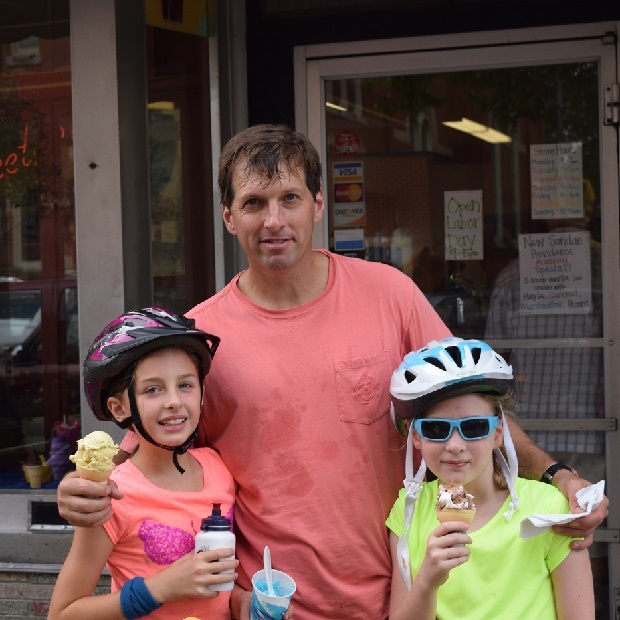 Making memories centered around the bike and cool treats. Here the girls in the photo enjoy time with dad at one of the four local ice cream shops in La Crosse, Wisconson. Along the picturesque Mississippi River Valley this community offers many bike riding opportunities and great treats along the way. A year round bike destination check out the fun at the La Crosse Area Bicycle Festival, September 2-5, 2016. 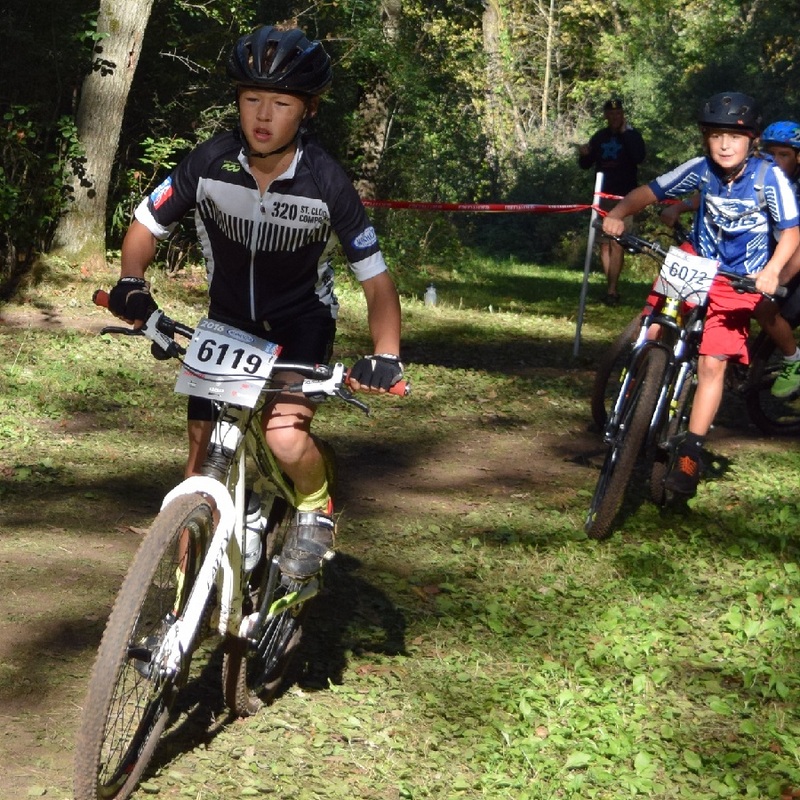 This entry was posted in News and tagged #FindYourNextAdventure, bike, bike tours, bike trails, family bike memories, family mountain biking, Ice cream smiles, La Crosse Area Bicycle Festival on February 12, 2016 by Russ Lowthian. These ladies sure know how to cut loose, taking a break from touring the countryside on their two-wheel steed’s, having a little fun along the way! If you have a fun photo you would like to share with our HaveFunBiking readers please send to editor@havefunbiking.com. 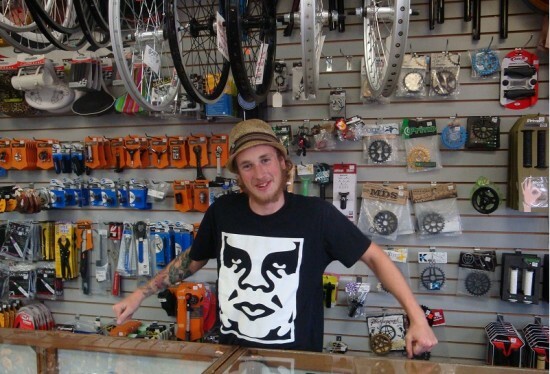 This entry was posted in News and tagged bike tours on June 16, 2014 by Russ Lowthian.